The original HiQnet vision of 2005 was to create a common control platform for all devices from microphone to speaker. Seven years later, the tally of devices in the HiQnet family exceeds 150 – from wireless microphone hubs, mixing consoles and signal processors, to amplifiers and powered loudspeakers. Several HiQnet software applications exist to provide true system configuration and control, each with feature sets tailored for the specific system application or scenario. 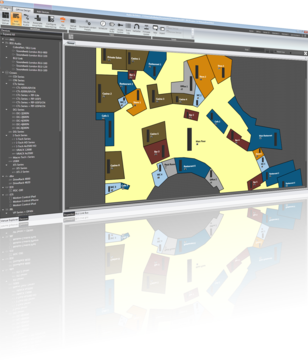 The brand new HiQnet Audio Architect™ audio system design and configuration software application retains the revolutionary system design philosophy centered on operational workflow first introduced in HiQnet System Architect™. In creating Audio Architect, Harman has also incorporated the BSS Audio Soundweb London DSP system backbone within the core functionality of System Architect – combining the power of our proven open-architecture platform with AKG wireless microphones, Crown amplifiers and JBL powered loudspeakers. HiQnet Audio Architect will replace HiQnet System Architect as Harman’s primary installed sound system configuration and control software application. Although modeled on System Architect operation, it is so much more than System Architect version 4, that it demanded a new identity all to itself. It features the widest range of audio devices and audio network transports at your disposal in any single audio system design software interface available today. By bringing together the two worlds of HiQnet System Architect and Soundweb London to create HiQnet Audio Architect, we have created the next stage in the evolution of audio system design software.